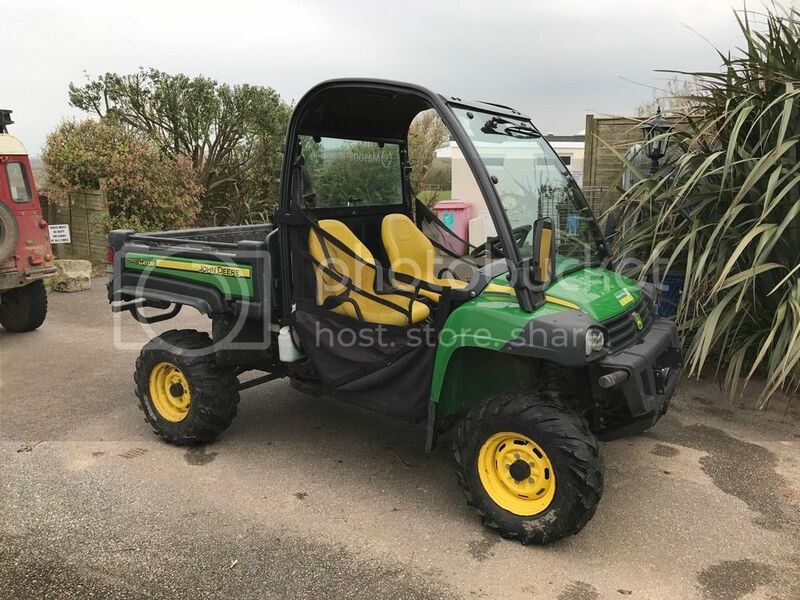 has anyone got a.......ROAD LEGAL... john deere gator...........if so what model and is it reliable......what sort of mileage do you getout of it...is it petrol air cooled ...or water cooled...desiel ? Is this a LandRover replacement? Use one regularly around the small holding I go to a couple of days a week, it's the little cx. 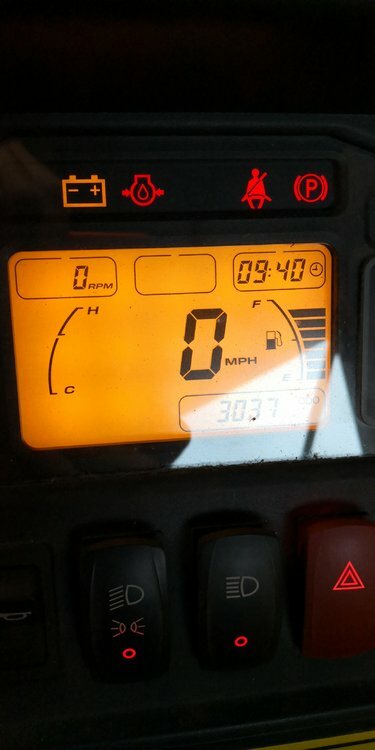 it's got 100+ hours on the clock rather than milage. Engine is air cooled petrol. doulbt it could be road legal due to a top end of 15mph according to the book. I've seen plenty of the larger models on the roads in rural areas. 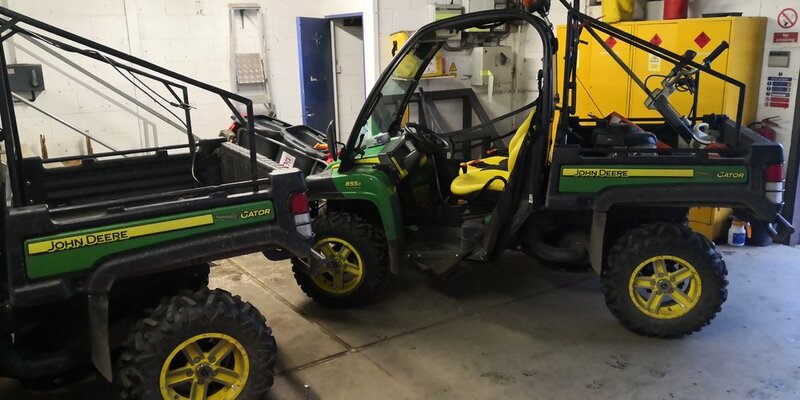 I have a John Deere Gator 855d, 3 cylinder diesel. Best bit of kit we have ever bought. Top speed 34 mph. This is the same model that’s used on most big shoots around here. I use it on my Caravan and camping park and on my syndicate shoot about 4 miles away, great for lamping. Ours has done about 1250 hours without any problems. It’s on a 2015 plate but we will be chopping it in for a newer one in a month or so. Before we bought this one I had a Honda, Polaris, and something else on demo, in my opinion nothing came close to the John Deere. Photo of mine looking very clean, love popping to the town in it easy to park and kids young and old love it. thats vgood info.............what other makes are there ? Polaris ranger Kawasaki mule are possibly what you can get over here, i think this will be your problem what was sold or is sold over here. 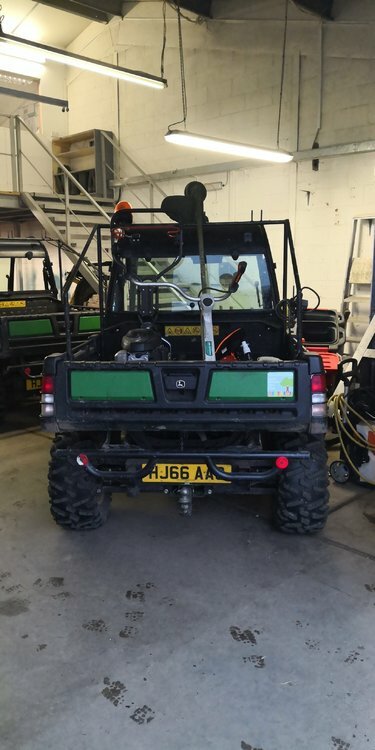 Dont dismiss the chinese taiwan imports What is there in UTVS from the uk importers. ? . Not seen one but i would want a Cl_Edi4uSUoYamaha wolverene . i have a 600 grizly Yamaha ATV its battered but still good, i would look at a yamaha UTV They might sell them here. 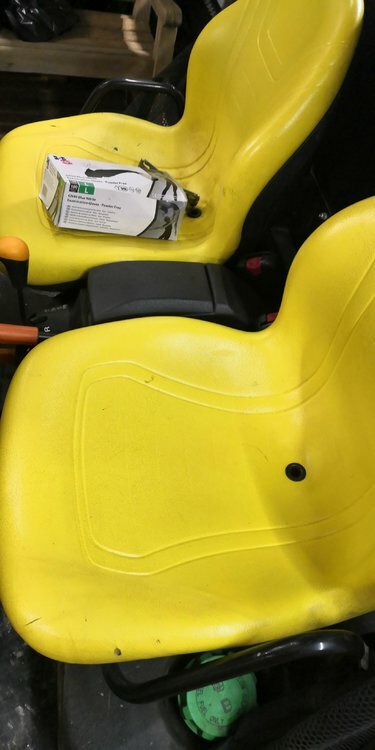 Wolverene and the Vking i like yamaha have a search see what available this side of the ditch. .
Have those plastic yellow seats started to crack up yet ? I know a lot of the earlier models had that problem. Not had a single problem with it including the seats. I will take special care of the window at that price. My main reason for buying John Deere compared to the others is it seemed more up to the job and not so much plastic bits to break like side bits. I also thought the build quality was more heavy duty, more farm and less country lane. I know both our new ones have had trouble with fuel getting through. We service them every year, new john deere service parts through out, we dont reuse, we chuck and change everything regardless. Weve the flash models with alloys, and electric tilt bed. Also the other ****** is ours are restricted to 24mph. We could take the restrictor off, but were not allowed due to council policy. 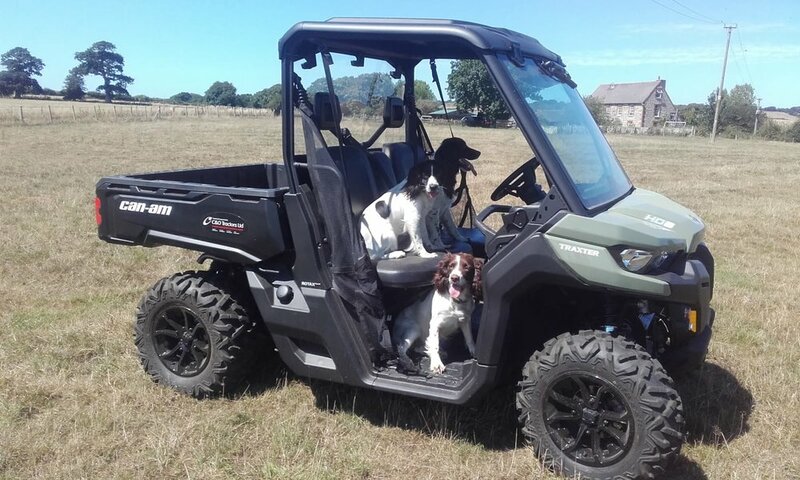 Imho they are ok, but the kawi mule i used to use i liked better as it had a bench seat. As for the kubota i found it horrible and was glad when that went. These diesels apparently will do about 35mph. As for range, cant help much other than that we fill em and empty it in a week, guessing (and i mean guess) about 6 miles a day average. We only potter around town and on our nice level open spaces. But they have small tanks. Dont know the litres it holds sorry. Oh will say they are quite torque, we chained 2 together last year and pulled a 7.5ton lorry up a pebble/rock slope he was stuck on last year. Also pulled a 1/4 tonne tree out the river last week. thats interesting........i would be doing the same mileage and a bit of minor off road...would go to more freindly all-terain tyres.....what speed would they do with the restrictor off...45mph ? Mine will do 34 mph on the flat, i have never worked out the mpg I fill it up for about £20 which lasts me a good week or more depending on the work. This will included going to the feed store, the shoot a few times and towing caravans and stupid big front wheel drive motorhomes that can’t drive on wet grass. Selectable 2 and 4wd at the touch of a button and locking diffs. I have been through some very wet stuff that I would not take my Defender through with no problems. Doors are great in the winter but hot in the summer but easy to remove. I thought you said you were getting one of those mobility scooters from Acle sales!!!!!!!! Then again, making threats about shooting down a Commercial Airliner could get you a lovely visit- let me get my Company phone with its list of ‘special’ numbers. my god...............you are allowed to work a phone unsupervised.................who was your maths teacher ..Diane Abbot..